Hi everyone! I am back with another TCP (The Cat's Pajamas) card today. This image really speaks to me. I LOVE movies. In fact, while I stamp, I watch movies. I enjoy romantic comedies, crude humor, and comedy for stamping. 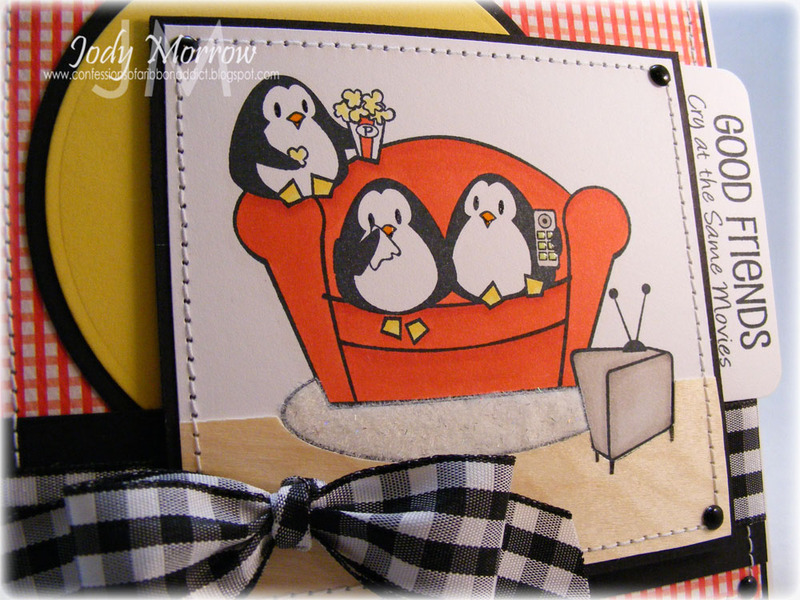 While I made this card, I was watching the newly-released Bounty Hunter with Gerard Butler and Jennifer Aniston. It's cute. :) Movies to steer clear of while stamping: The Notebook (hello sob fest), Click (tears), Marley & Me (being a pet owner now, this one gets me LOL)... so, keep it light and fun to keep your mojo in check. 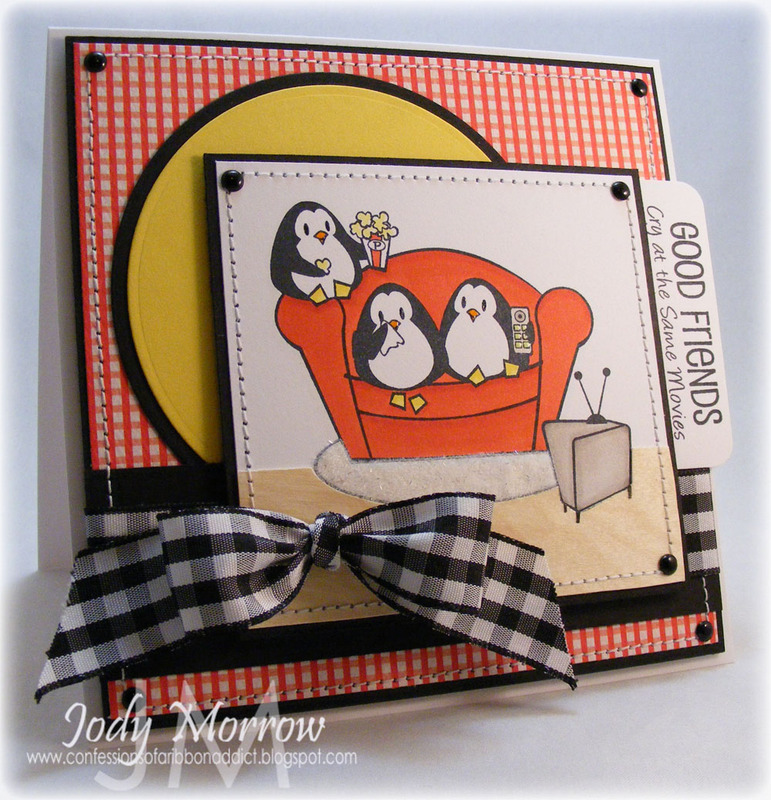 This stamp set, Good Friends is perfect for movie/TV lovers. I went with a traditional "movie color combo": red, black, yellow, and white. Hardwood floor ala Thin Wood Veneer Paper Please note I actually STITCHED on it, and it was FINE! YAY It's literally wood... and paper... strange and cool at the same time. Thanks for stopping by! I'll see you soon. I have a bunch more cards to share. Question of the day: Do YOU watch movies while stamping? What are some of your favorites? Love the card!!! I ususalyy watch a movie that I can sing to!!! Disney, Rent, Pahntom, Chicago, etc. So I don't really need to "watch" them... Or I have all the seasons of Greys Anatomy- always good to watch too or ANY Pixar movie... I have to be careful if I put in a movie I haven't seen before- I forget to stamp! Really cute! I love the fluffy rug. This is SO you! I totally love it! So totally cute!! LOVE the floor!! Oh how fun! Love the sparkly fluffy rug! CUTENESS!